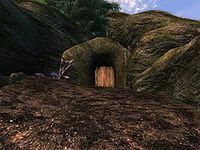 Shattered Scales Cave is a medium-sized cave far southeast of Bravil containing monsters. 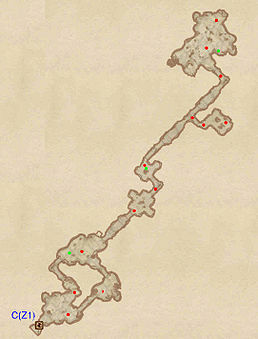 It contains two zones: Shattered Scales Cave and Shattered Scales Long Run. This cave contains 68 Cairn Bolete plants and 56 Wisp Stalk plants. 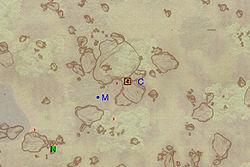 This location's map marker (M on map) is named Shattered Scales Cave (editor name ShatteredScalesCaveMapMarker). The entrance door is ENE of the marker, 60 feet away. 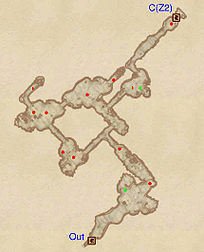 Shattered Scales Cave is fairly unremarkable, contains a minimum of treasure compared to the huge amount of enemies, and is almost entirely linear with the exception of the very first intersection; if you head left you will encounter up to six enemies and no treasure, while heading right is safer and lands you in the same spot anyway. Take the tunnel leading northeast, pick the minor loot from the chest and go through door C to the next zone, Shattered Scales Long Run. The name describes this zone perfectly as it is basically one long tunnel with only a few, and mostly unprofitable, detours along the way. 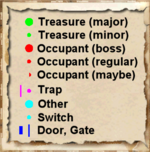 In the first small room you can choose between two tunnels, both leading to another small room with a minor loot chest. Proceed through the northeastern tunnel and fight your way through hordes of enemies and pry open the various chests you encounter. At the end of the road is a semi-large dead-end room guarded by two monsters and another minor loot chest. The only way to exit this zone is by backtracking all the way back to door C to reenter the first zone, Shattered Scales Cave.